When it comes to gluten-free pasta sauces, there's good news and bad news. First, the good news: most tomato sauces and white pasta sauces on the market do not contain gluten ingredients, and many are considered to be safely gluten-free. But the bad news is, you can't just grab any jar or can off the shelves and assume you'll be okay. Those with celiac disease and non-celiac gluten sensitivity need to be wary of pasta sauces made by some manufacturers, since they may be subject to significant gluten cross-contamination, and therefore won't be truly gluten-free (the U.S. Food and Drug Administration defines gluten-free as less than 20 parts per million of gluten). A handful (not many, but some) even include gluten ingredients. This guide to gluten-free pasta sauces (including traditional spaghetti sauce, tomato sauces in a wide range of flavors, and white cheese and cream-based sauces) can help you decide which brand to buy. Many are safe on the gluten-free diet, and in some cases, their manufacturers take extra steps to ensure the lowest possible risk of gluten cross-contamination. Other pasta sauce brands may offer certain varieties that are gluten-free, but also make gluten-containing pasta sauces. The information below should help you to choose a pasta sauce to accompany your gluten-free pasta (or pizza, or whatever else you want to use it on). 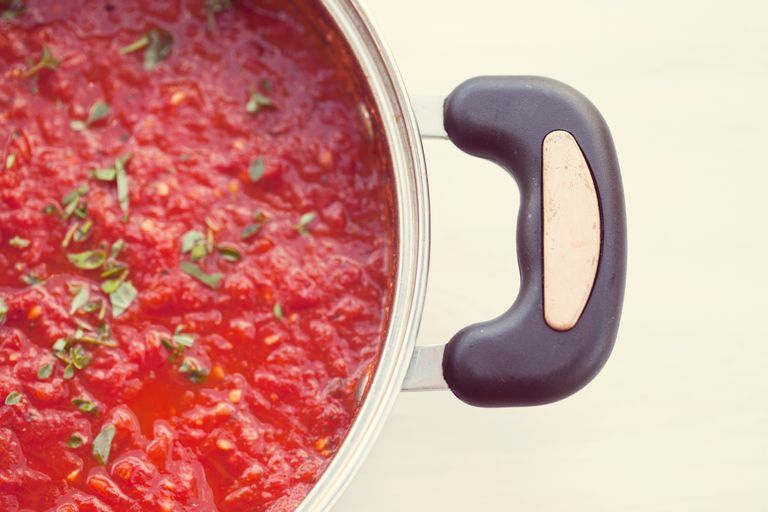 Here's the list of pasta sauce makers, plus their products' gluten-free status. Amy's Kitchen. Amy's makes four different pasta sauces: family marinara, tomato basil, "light in sodium" family marinara, and "light in sodium" tomato basil. All appear on the company's gluten-free list, which means they contain less than 20 parts per million of gluten. Barilla. Out of 12 Barilla tomato-based sauces, six flavors are considered gluten-free (to less than 20 parts per million): marinara, meat, mushroom, roasted garlic, spicy marinara, and sweet peppers. All are processed on the same equipment as sauces that are not labeled gluten-free. Barilla's traditional basil pesto, its creamy Alfredo, and its garlic Alfredo are not gluten-free. Bellino. Bellino spaghetti sauce is made by Cento, and also appears on the company's gluten-free list (see the Cento entry for details). Bertolli. This company makes a huge variety of different tomato-based and white pasta sauces, plus frozen meals, olive oils, and cooking sprays. According to Bertolli, any product (including its pasta sauces) that includes a gluten ingredient will call out that ingredient on the label. The company does not keep a list of gluten-free products, nor does it test for trace gluten. Cento. Cento is a large company that makes a variety of Italian-themed foods, including pasta sauce, under different brand names. According to the company, numerous Cento brand sauces are considered gluten-free to FDA standards, including red clam sauce, white clam sauce (the starch in this is modified corn starch), pizza sauce, pasta sauce, marinara sauce, vodka sauce, arrabiatta sauce, porcini mushroom sauce, and pesto sauce. Always check ingredients, as they can change at any time. Cento products do not state "gluten-free" on the label, although the company keeps an extensive list of gluten-free options (including Anna gluten-free pasta, which it imports from Italy) on its website. Classico. All Classico's jarred white and red sauces are considered gluten-free to less than 20 parts per million, according to the company, which does not make any gluten-containing products. The extensive gluten-free list includes the company's many flavors of red pasta sauces (ranging from four cheese to Italian sausage), the Classico Riserva line of sauces (flavors that include eggplant & artichoke, and puttanesca), the three tomato cream sauces, and five creamy Alfredo sauces (thickened with milk and cheese, not flour). Contadina. This brand of canned tomatoes and tomato sauce products is owned by Del Monte Foods, Inc. According to the company, all tomato sauces and all pizza sauces are considered gluten-free to less than 20 parts per million. This includes Contadina's plain tomato sauce, garlic & onion tomato sauce, tomato sauce with Italian herbs, extra thick & zesty tomato sauce, four cheese pizza sauce, pizza sauce flavored with pepperoni, original pizza sauce, and pizza squeeze. You should avoid the Italian Tomato Paste with Italian Seasonings, as that does contain gluten (in the form of "wheat gluten proteins"). You should assume that all these products, including the one that contains wheat gluten, are produced in the same Del Monte processing plants. Dei Frattelli. Dei Frattelli, a brand owned by Hirzel Canning Co. and Farms, offers eight different jarred pasta sauces: Arrabiatta, fire-roasted vegetable, homemade style, marinara, three cheese, tomato and basil, and traditional. All are considered gluten-free, and several of these also are dairy-free. Note that Dei Frattelli does not manufacture anything with gluten in it. In fact, this is the same company that makes Silver Floss sauerkraut, which is well regarded in the gluten-free community for being reliably free of any trace gluten. Dei Frattelli also makes boxed and canned tomatoes, if you're interested in making your own sauce. Del Monte. Del Monte (which also produces Contadina sauces) states that its canned tomato sauce, no salt added tomato sauce, and tomato sauce with basil, garlic & oregano are considered gluten-free to less than 20 parts per million, as are its pure tomato products. Always check the label, as the company does use gluten ingredients (specifically, gluten protein) in other products, which are made in the same facilities. Eden Foods. Eden makes spaghetti sauce and pizza/pasta sauce in jars and cans. According to the company, both meet the FDA's definition of "gluten-free" (less than 20 parts per million). The company takes careful steps to ensure all ingredients in the food are gluten-free and sends samples to an independent testing company to check for trace gluten. It also adheres to stringent manufacturing protocols that seek to prevent cross-contamination. Emeril's. Out of the nine pasta sauces Emeril's makes, five are considered to be gluten-free to less than 20 parts per million: Roasted Gaaahlic Sauce, tomato and basil sauce, Kicked Up tomato sauce, chunky marinara sauce, and roasted red pepper sauce. Some of these contain soybean oil (check the ingredients if you're sensitive to soy). Avoid the homestyle marinara, the Alfredo sauces, and the vodka sauce, as they are not considered to be gluten-free. Note that all these sauces are produced on the same equipment. Francesco Rinaldi. This smaller producer of jarred tomato and pasta sauces makes a range of traditional sauce products, plus a line of "healthy" products featuring no salt, no sugar added sauces, and sauces that are fortified with DHA omega-3 fatty acids (these carry the American Heart Association's certification seal). All of Francesco Rinaldi's sauces are considered gluten-free to less than 20 parts per million. Muir Glen Organic. Muir Glen Organic, a General Mills company, makes numerous pasta sauces. However, General Mills no longer maintain a gluten-free list, since products and ingredients change so rapidly. A customer service representative advises checking the label for a prominent "gluten-free" emblem. If the label doesn't say "gluten-free," then the company doesn't consider it to be safe. Newman's Own. Newman's Own makes 19 different flavors of tomato and pasta sauce, ranging from organic tomato basil to Sockarooni (with peppers and onions). None contain gluten ingredients. However, Newman's Own doesn't test for trace gluten. Organico Bello. This small certified organic, certified non-GMO pasta sauce maker offers four flavors of sauces: marinara, spicy marinara, tomato basil and kale tomato basil. None contains gluten ingredients, and the sauces are labeled gluten-free (to less than 20 parts per million). However, the company reports that wheat and other allergens (including wheat, milk, egg, fish, peanut, tree nut and soy) are used on the same manufacturing lines, although not on the same days. The company employs a "thoroughly documented analytical allergen control program that ensures no cross-contamination," and it stores allergenic ingredients, including wheat, separately. Organicville. As the company's name suggests, Organicville makes certified organic products. Its pasta sauces are made with 100 percent extra virgin olive oil and agave nectar and include four options: marinara, tomato basil, Italian herb, and mushroom. All are labeled gluten-free (with less than 20 parts per million). Pomi. These are the boxed Italian tomatoes and tomato products you probably have seen in the grocery store. Even though these products include only tomatoes as their ingredients, a Pomi customer service representative reports that they are processed on the same line used for sauces containing gluten, tree nuts, eggs, and dairy. The company does have procedures designed to minimize cross-contamination but acknowledges that some people can have reactions at very low doses. Prego. Prego, which is owned by Campbell Soup Company, has an extensive list of 24 sauces it considers gluten-free, ranging from Traditional and Marinara to Florentine Spinach & Cheese and Creamy Vodka. Three "Heart Smart" varieties also are on that list: Heart Smart Mushroom, Heart Smart Roasted Red Pepper & Garlic, and Heart Smart Traditional. The sauces all meet FDA standards of less than 20 parts per million. Prego reports it has a "strict two-step process for validating a product as gluten-free and ensuring that it meets FDA's criteria for the claim." The company verifies the ingredients as gluten-free and tests the finished product for trace gluten, and then repeats the testing every six months. Rao's Specialty Foods. The pasta sauces from this New York City-based company, which are sold in stores and online by the case, all are considered gluten-free (to less than 20 parts per million), according to a customer service representative. In addition, they're produced in a gluten-free facility, away from where Rao's makes its pasta, the representative said. Note that the company's website doesn't note "gluten-free" on all Rao's sauces, but the rep says they're all gluten-free. Rao's balsamic vinegar and the glazes that contain it are not considered gluten-free (and obviously, neither is Rao's wheat-based pasta). There are numerous gluten-free-labeled tomato and pasta sauces from which to choose, including some that are made in dedicated gluten-free facilities. Note that I didn't find any ready-to-eat pasta or tomato sauce that is gluten-free certified. Some people who are quite sensitive prefer to stick with certified gluten-free products since the companies that make those products take extra steps to ensure they are free of trace gluten and gluten cross-contamination. If gluten-free certification is important to you, you may want to consider making your own tomato sauce with Jovial Foods diced, crushed or whole tomatoes, which come in jars and are sold online and at some specialty retailers. Jovial is certified by the Gluten-Free Certification Organization to contain fewer than 10 parts per million of gluten.